I want to pose two positions or ideas that have emerged in the progressive community over eliminating some tax credits during this contentious legislative session. 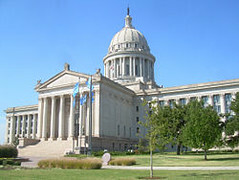 The first position, one put forth by Oklahoma House Democrats and the Oklahoma Policy Institute, is the state should eliminate unneeded tax credits and expenditures in order to raise revenues during a major budget crisis. The argument is simply that the state should also find new revenue as state agencies absorb deep cuts. Those cuts include layoffs and furloughs of teachers and other state employees. House Democrats, for example, want to explore some business tax credits that could be cut. The OK Policy Blog, written by David Blatt, had a post this week looking at limiting tax expenditures for oil and gas companies. Blatt, who operates the Oklahoma Policy Institute, has taken an in-depth and insightful look at the overall issue of tax credits. The Oklahoma Gazette recently published an excellent story by Scott Cooper about tax credits. Raising revenue by eliminating tax credits seems prudent and responsible, but it wouldn’t solve the budget crisis the state faces for the next fiscal year. Blatt estimates an $800 to $850 million shortfall for next fiscal year and argues state agencies will have to absorb 10 to 12 percent cuts. The second position, which is a larger, philosophical argument, is to simply do nothing on the issue and let Republican ideology dictate next year’s budget. This could wake people up here to the starve-the-beast mentality of the GOP. Once people realize their children are now in classes with 40 to 50 other students or they can’t get social and health services, they might realize how much the recent income tax cuts and declining revenues have actually impacted their lives and how many Republicans actually see the budget shortfall as an opportunity, not a crisis. In other words, let the Republicans have their day without a fight and see how it turns out for them. The fact remains Oklahoma has become a conservative bastion, a museum of failed right-wing ideologies. Most progressives often talk about a breaking point or a particular action, event or leader that could change the state’s political direction. Could this be such a breaking point? Should we let the GOP take full responsibility for the budget disaster and hope something new and positive will emerge from the ruins? I’m not endorsing this view, but the fact the idea is even out there says much about the state’s current political climate.